Enjoy This Week's Episode of FINDING YOU! "where real people talk about real things"
Finding "YOU" With Marvin Roane airs live on Blog Talk Radio each Wednesday at 3:00PM. The Purpose of Finding "YOU"
For over two decades Marvin Roane has changed lives as "Empowerment Coach" and "Mentor." 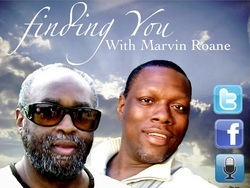 On his show, "Finding YOU" and Empowerment 365, Marvin offers support and assistance to everyday people in an effort to get their lives back on track after experiencing the problems and setbacks of everyday life. He shares his views on his Empowerment Program, life changing methods, his philosophy, tips and information with his listeners. Stan Maclin is a graduate of Eastern Mennonite Seminary. He has held several pastorates, traveled internationally and has participated in many service projects in Jamaica and Africa. He is currently serving as Founder and President of the Harriet Tubman Cultural Center located in Harrisonburg, Virginia. He served as Executive Director for 16 years of a mission organization to Empower residents of public housing projects in Illinois. Additionally, he served for 12 years as National President of the African American Mennonite Association. He is the proud husband to his wife of 40 years, they have 6 children and 11 grandchildren. His hobbies include drumming, playing in a local band and social networking. He has demonstrated the ability to interact with all people at all levels from executive to grassroots involvement. Racial harmony and equality are his interests. Were living in a crazy mixed up world, where at times things just don't always make sense. In a world where many of us are feeling as if our lives are out of balance and many have lost their way. Where do YOU turn to get things back in perspective? If you are sometimes stressed, overworked or feeling as if you've had enough. If you are unemployed and struggling to find a way? If you are experiencing problems in your personal life and with relationships, if YOU are in need motivation and inspiration, if YOU you are having a difficult time reaching your personal goals or if YOU just need to get some things off of your chest? Finding YOU is the show for YOU! Discussing relevant topics and current events, providing an outlet where real people have a voice? Whether its social, political or personal, the Finding YOU team will get to the heart of the matter with frank honest real talk. What makes us unique is the fact that Finding YOU focuses upon and promotes values, morals and personal integrity! It's a show where you can express your ideas, thoughts and feelings without all of the theater and drama? If you are looking for straight talk and for the plain truth, then look no further than FINDING YOU! It's a show were real people talk about real things! Plug into the Power of personal Empowerment each Wednesday at 3:00pm. Plug into the power and begin to Find yourself! Tell A Friend About Finding "YOU" Today!